...yes, I have to include Thomas Jefferson. His French chef in the White House, Honore Julien, served ice cream encased in pie crust in Feb. 1802. More in a previous post HERE. Forty years later, an article about Peking described "roasted ice" which "few cooks" could prepare. It was covered in "paste" (pie crust) and deep fried. Different recipe, no meringue, but similar concept - ice cream survived heating. In 1846 Alexis Soyer, famed British chef and author, wrote possibly the first English recipe for ice cream covered with meringue - pineapple Glace Meringue au four (Ice cream meringue in oven). Also included in this post (following the Alaska-named recipes) are recipes for: a baked ice-cream on a German steamship 1876, "German biscuits" 1883 and Meringue au Four 1887. Charles Ranhofer, (1836-1899), the chef (starting in 1862) at the famed NYC Delmonico's included a recipe in his 1894 book for "Alaska, Florida". He is sometimes - incorrectly - credited with creating the dessert, but he probably was the first to title it after Alaska, by at least 1880. 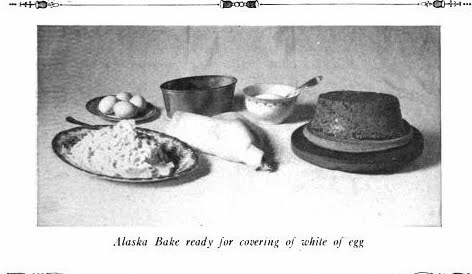 George Sala wrote in two books about eating "Alaska" on New Years Day, in 1880 at Delmonico's. 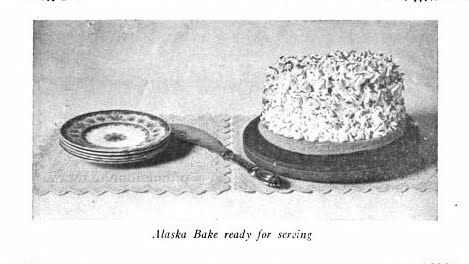 "Baked Alaska" appeared in Fannie Farmer's 1896 Boston Cooking-School Cook book. Cover thickly a two-quart brick mould of ice cream with a meringue made from the whites of six eggs and six tablespoonfuls of powdered sugar. Stand the dish on a board, and place it in a very quick oven to brown. The meringue acts as a non-conductor, and prevents the heat from melting the ice-cream. It may also be browned with a salamander or a heated fire-shovel. A dainty dish for one's guests. Charles Ranhofer included his version - "Alaska, Florida" in his book The Epicurean (1894) from his years at Delmonico's (1862-1876, 1879-1896). Prepare a very fine vanilla-flavored Savoy biscuit paste (No. 3231). Butter some plain molds two and three-quarters inches in diameter by one and a half inches in depth; dip them in fecula or flour, and fill two-thirds full with the paste. Cook, turn them out and make an incision all around the bottom; hollow out the cakes, and mask the empty space with apricot marmalade (No. 3675). Have some ice cream molds shaped as shown in Fig. 667 [first image], fill them half with uncooked banana ice cream (No. 3541), and half with uncooked vanilla ice cream (No. 3466); freeze, unmold and lay them in the hollow of the prepared biscuits; keep in a freezing box or cave. Prepare also a meringue with twelve egg-whites and one pound of sugar. A few moments before serving place each biscuit with its ice on a small lace paper, and cover one after the other with the meringue pushed through a pocket furnished with a channeled socket, beginning at the bottom and diminishing the thickness until the top is reached; color this meringue for two minutes in a hot oven, and when a light golden brown remove and serve at once. I dined at Delmonico's [New-Year's Day 1880] hard by the Fifth-avenue Hotel, a few nights ago; and among the dainties which that consummate caterer favoured us with, was an entremet called an "Alaska." The "Alaska" is a baked ice. A beau mentir qui vient de loin; but this is no traveller's tale. The nucleus or core of the entremet is an ice cream. This is surrounded by an envelope of carefully whipped cream, which, just before the dainty dish is served, is popped into the oven, or is brought under the scorching influence of a red hot salamander; so that its surface is covered with a light brown crust. So you go on discussing the warm cream souffle till you come, with somewhat painful suddenness, on the row of ice. E'en so did the Shepherd in Virgil grow acquainted with love, and find him a native of the rocks. 2 quart brick of ice cream. The board, paper, cake, and méringue are poor conductors of heat, and prevent the cream from melting. Slip from paper on ice cream platter. Occasionally termed "hot ice cream" and delicious when successful. If directions are followed it is not difficult to make this attractive change from the ordinary cream. Make a pineapple cream ice as directed (No. 1384), and when well frozen have ready a plain oval ice-mould, place the cream in it, filling it quite tight, close and bury it in ice and salt until five minutes before ready to serve, then dip it [mould] into lukewarm water, and turn it out upon your dish, which bury up to the rim in ice and salt upon a baking sheet, have ready a preparation of meringue as directed for petits biscuits glacés, (No. 1318), with which cover it over, place it in a warm oven a minute, just setting the meringue, which will blister and brown slightly, and serve immediately. This dish was at least a curiosity, served at the table of one of the German steamers. A flat, round sponge-cake served as a base. A circular mold of very hard frozen ice-cream was placed on this, and then covered with a meringue, or whipped white of egg, sweetened and flavored. The surface was quickly colored with a red-hot salamander, which gave the dish the appearance of being baked. The gentleman who told me about this dish insisted that it was put into the oven and quickly colored, as the egg surrounding the cream was a sufficiently good non-conductor of heat to protect the ice for one or two minutes. However, there is less risk with a salamander. 1 quart Cherry Juice, No. 29. Beat the yolks and sugar to a cream, mix with the juice, cook in a farina boiler, until it coats the spoon, then strain into a porcelain-lined bowl, and set on ice. Dissolve the gelatine in just enough warm water to soften and melt it, and stir into the above; it will soon thicken. Meanwhile the cream, which should be of the richest possible quality, must all be whipped to a stiff froth, and stirred into the fruit custard. Fill the cases, —-which must be 1 inch deep,—three-quarters full, and freeze as directed in No. 131. Fill the cases with a layer of Pineapple or Lemon Water-Ice, and keep in the cave till required for serving. They may also be glazed with meringue either white or colored with Carmine, No. 50, like the French. Upon a large sheet of tin, spread several sheets of glazed white paper, or a sheet of card board, on which place the cases of frozen biscuits, glazed with meringue, and set closely together, and surrounded with rolls of cloth or soft paper. Set them into a very hot oven, for about 15 seconds, or just enough to faintly brown the glaze, but not in the least melt the biscuits. Replace them quickly in the cave, and keep them there till served. Work rapidly and handle gently. Another method is to make them in long tin moulds, like the French Biscuits, cut them to the proper size, place on card board, glaze with meringue on top, sides and ends, and brown in the oven or with a hot salamander or shovel. A daintier surprise for one’s guests can hardly be named than this Baked Ice Biscuit. Baked Ice Cream or Glace Meringue Au Four—Ice cream turned out of a mould, covered with very cold meringue and quickly browned a little in a hot oven or with red-hot iron. Ice Baked In Paste or Glaces Au Four—Small pieces of ice folded in paste carefully to exclude the air; baked brown quickly in a hot oven. They are prepared to serve one hot ice-cream. Use the lower half of a round sponge-cake as the base; upon this place a small, very solidly-frozen form of ice-cream. Cover this thickly with a very stiff meringue of sugar and white of egg. Sprinkle with sugar. Heat a salamander, or, the kitchen shovel, red-hot, and hold it sufficiently close to the meringue to brown it on all sides. This gives the appearance of having been roasted, and at the same time the ice-cream remains perfectly frozen. The uninitiated are quite convinced that it is roasted, and are much amazed at this culinary curiosity. But I remember that at Delmonico's restaurant, at the corner of Fifth Avenue and Twenty-sixth Street, New York, they served us, on New-Year's Day 1880, with a baked ice, appropriately styled an 'Alaska,' The core of this 'torridofrigid' preparation was a very firm vanille ice. Round it was a souffle, or a whipped cream, I forget which. Then the preparation was lightly baked, or else browned with a salamander. It was strangely good. The souffli was quite hot and the ice was quite cold; and we were not, immediately afterwards, taken to, the Bellevue Hospital to be treated for indigestion.